Fresh and fragrant cilantro infuses a classic frozen margarita with extra South-of-the-border flavor. Be inspired by the delicious ingredients of your frozen concoction and pair it with mini skirt steak fajitas that feature a light and tasty salsa verde for a match made in paradise. To make the frozen cilantro-lime margaritas, add ice to the reservoir then mix together lime juice, fresh cilantro, tequila and orange liqueur in your Margaritaville® Jimmy Buffett Anniversary Edition Key West™ Frozen Concoction Maker®, and then pour into glasses rimmed with salt. For the fajitas, grill strips of skirt steak and then thinly slice. While steak is cooking, mix together finely chopped cilantro, lime juice, salt, black pepper, minced tomatillos, minced garlic and cumin in a large bowl. Place steak strips on a 6-inch tortilla, top with salsa, roll up and serve alongside your freshly made frozen concoctions. Pair sweet barbecue chicken wings with freshly made frozen concoctions. Escape to paradise anytime you've got a craving for flavorful eats and a refreshing frozen concoction! Making this classic drink frozen and adding a splash of vanilla flavor makes it an extra-indulgent treat that will cool you off in no time, then pair with sweet, tangy wings. To make the frozen concoction, add ice to the reservoir then mix together rum, vanilla extract and cola in your Margaritaville® Jimmy Buffett Anniversary Edition Key West™ Frozen Concoction Maker®. Pour into tall glasses and serve. 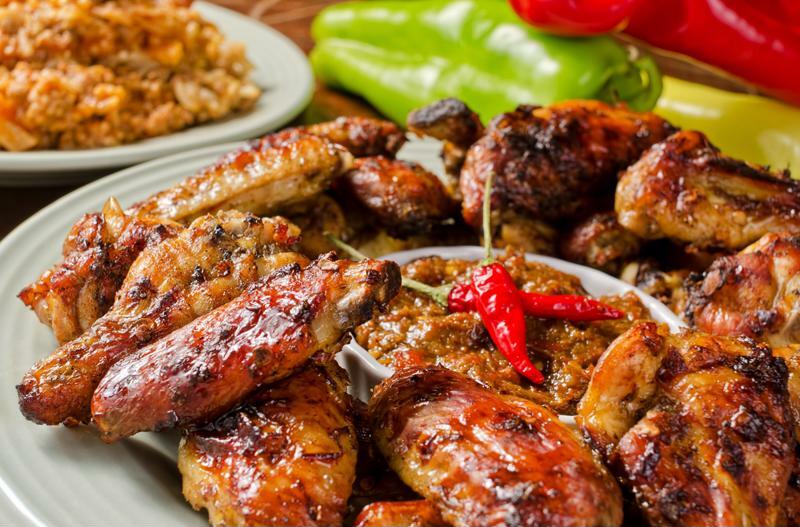 To make the Sweet Barbecue Chicken Wings, start by marinating wings in a mixture of Worcestershire sauce, pickle juice, olive oil, garlic, salt, pepper and brown sugar. Grill until cooked through, then enjoy alongside a Frozen Vanilla Rum and Cola. Juicy mango mixed with rum to create a refreshing frozen concoction? Sounds like a winning pick. Up the tastiness factor even higher by pairing this frozen concoction with a fruity appetizer that's equal parts salty and sweet. Start creating this taste sensation by first adding ice to the reservoir then mixing together fresh mint leaves, cantaloupe cubes, honeydew melon cubes, melon liqueur and rum in your Margaritaville® Jimmy Buffett Anniversary Edition Key West™ Frozen Concoction Maker®. Pour into glasses rimmed with sugar and garnish with fresh mint sprigs. Next, create the appetizer by wrapping cubes of cantaloupe with thin prosciutto slices. Secure with a toothpick and serve. A frozen piña colada is perfect with island pork skewers. Reset the clocks to island time with this perfect frozen concoction and appetizer pairing. 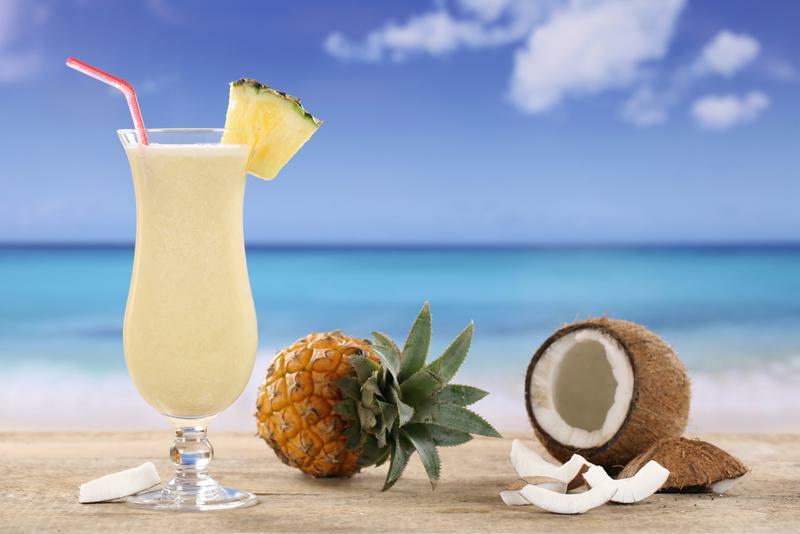 A frozen piña colada is even more refreshing than the original and features lots of rich coconut and pineapple flavor. Pair it with sweet pork skewers marinated in a tropical-inspired sauce and you've got yourself a pitch-perfect combo. Start by adding ice to the reservoir then mixing together white rum, pineapple juice, coconut milk and coconut cream in your Margaritaville® Jimmy Buffett Anniversary Edition Key West™ Frozen Concoction Maker®. Pour into tall glasses and garnish with a pineapple wedge and a colorful mini paper umbrella. To make the pork skewers, marinate 1-inch pieces of pork in a sauce made with pineapple juice, orange juice, brown sugar and olive oil. Grill the pork until cooked through, then slide onto skewers, alternating the pork pieces with pineapple chunks, and serve.